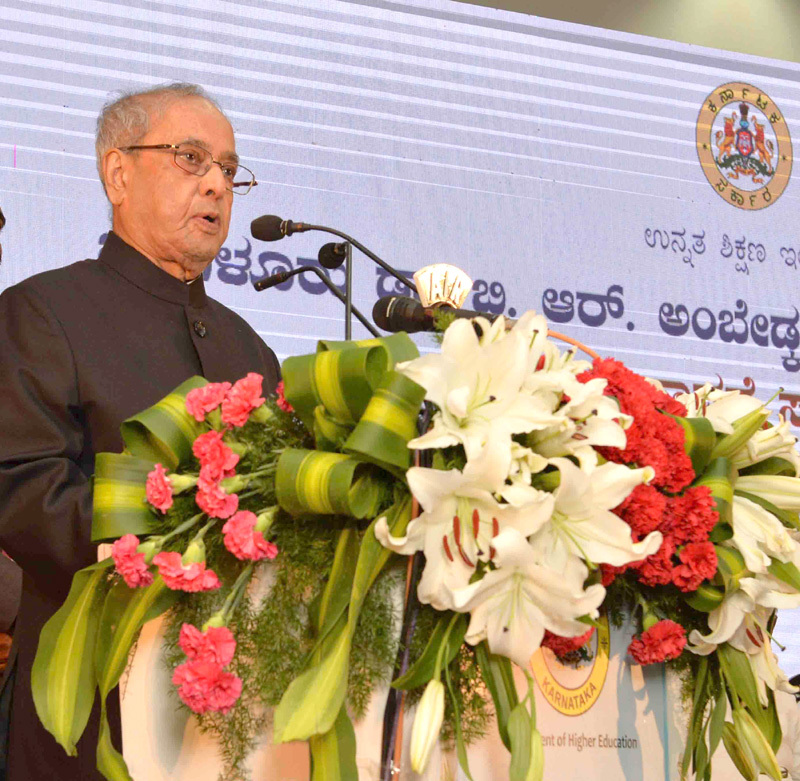 The President, Shri Pranab Mukherjee addressing at the foundation stone laying ceremony of the Bengaluru Dr. B.R. Ambedkar School of Economics, in Bengaluru, Karnataka on April 14, 2017. Bengaluru: The President of India, Shri Pranab Mukherjee laid the foundation stone of Bengaluru Dr. B.R. Ambedkar School of Economics today (April 14, 2017). Speaking on the occasion the President said that that Dr. Ambedkar was truly a legendary figure with a multifaceted personality. He shaped the Constitution of the largest democracy in the country and was the harbinger of full dedication and commitment for the poor and deprived. The President said that there has been significant expansion in the physical infrastructure of education in the country. However, every year, numerous students go abroad for higher learning. It is therefore important to create Institutes of international repute in India which can attract students and teachers from all over the world as was the case in ancient India when we had Universities like Nalanda, Taxila Vikramshila etc. He also said that India is going to emerge as a nation with a huge young population in the coming years. In order to ensure that this demographic dividend does not turn into a demographic liability it was important to equip the youth with necessary skills to increase their employability. The President said that he was happy to be laying the foundation stone of the Bengaluru Dr B R Ambedkar School of Economics today. He said that the School of Economics is being named after Dr B R Ambedkar to commemorate his 125th Birth Anniversary. It is indeed a matter of satisfaction that the foundation stone of the institution is being laid on the occasion of 126th Ambedkar Jayanti. The President hoped that this school upon becoming fully functional will become another feather in the cap of this great city, which has already made a mark in the IT, BT, Banking and industrial sectors. The President said that the education Institutions named after Baba Saheb are indeed a befitting tribute to Dr B R Ambedkar who was apart from being a constitutional expert, also a great economist and a committed advocate of universal education. He said that Baba Saheb attached great importance to education. For him it was a means to change one’s destiny. Baba Saheb attached great importance to education. For him it was a means to change one’s destiny. He had said, “Give up the idea that parents give ‘janm’ to the child and not destiny (karma). They can mould the destiny of their children by giving them education”.